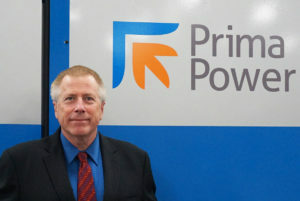 PRIMA POWER LASERDYNE , LLC, a world leading manufacturer of industrial laser systems, announced today the appointment of Ray Regan to the position of Regional Sales Manager for the LASERDYNE product line. In announcing the appointment, Mark Barry, Vice President of Sales and Marketing said Mr. Regan will be responsible for sales in the Central United States, Mexico and Canada. “Ray Regan joining the company is a strong addition to the sales team. His history, experience and knowledge of precision laser process will be asset in assisting customers with their laser processing needs,” stated Mr. Barry. Prior to joining Prima Power Laserdyne, Mr. Regan was Business Development Manager for Innovative Laser Technologies, responsible for expanding the customer base in various manufacturing sectors. Mr. Regan has wealth of laser processing experience including project management, applications engineering, customer support and sales. He also brings a wealth of expertise and experience for the automotive, general manufacturing, aerospace and medical manufacturing industries. Mr. Regan holds a BA degree from Cleary University and a degree in Electro Optics from North Central Technical College. Since 1981, Prima Power Laserdyne has been a resource for manufacturers requiring precision laser processing solutions around the world. Many companies recognize Prima Power Laserdyne’s product leadership in precision laser processing as well as their ability assist in the development of novel laser processing solutions for the most difficult applications. Prima Power Laserdyne is a wholly owned business unit of Prima Industrie Group. LASERDYNE and BeamDirector are registered trademarks of Prima Power Laserdyne.